Manchester City and Paris St-Germain are facing sanctions after breaching Uefa's financial fair play (FFP) rules. Fewer than 20 clubs are understood to have failed to meet key criteria. "We are about to find out if Uefa has the courage to back up its convictions. We've heard for a number of years that these regulations will have bite to them, that they will have teeth." Uefa has made settlement offers to all clubs deemed to have breached rules ahead of a meeting on Thursday. City must now decide whether to accept the offer made to them or try to negotiate a lesser punishment, which varies from a reprimand to a fine or European squad restrictions next term. The most powerful sanction, that of being excluded from European competition, is not expected to be implemented. While the settlements each club have been offered remain unknown, Uefa could reveal the outcomes as early as Friday. Any outstanding cases will go to an adjudicatory panel for a final decision if agreement cannot be reached. 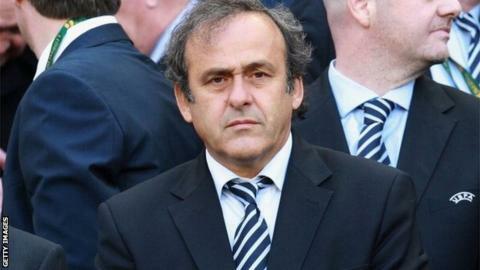 Uefa president Michel Platini said recently he did not think any of the clubs who breached rules would be liable to exclusion from European competition next season. Under FFP, losses are limited to £37m (45m euros) over the past two years. Qatar-owned PSG have been the club under most scrutiny after they wiped out their losses with a huge and back-dated sponsorship deal with the Qatar Tourist Authority. Platini said he was unsure if that "innovative" sponsorship deal with a related party played by the rules. BBC Radio 5 live sports news correspondent Richard Conway thinks Uefa is likely to focus on some kind of squad penalty for the serious offenders. "Perhaps a salary cap or limiting the number of eligible players," he said. "Perhaps making new signings ineligible for the Champions League." Clubs who have not been playing in European competition this season will not have to pass the FFP rules until next autumn.